The so called “democratic deficit” of the Union is no coincidence at all. European ideologues are dedicated to krypto-authoritarian models, which will bring about the complete elimination of the Demos, the bearer of democracy (as a political subject). The thinkers are only at odds, whether power should go to the bureaucracy in Brussels, the financial elites, a socialistic cadre party or to a newly formed antichristian aristocracy. But Europeanism has also been an instrument of shere “Machtpolitik”, i.e. power politics. Napoleon and Hitler wanted to achieve unification with the help of military campaigns. After 1945 the fan community ranged from the extreme left to the extreme right, from Trotskyism to postnationalistic faschism. Europeanist organizsations were sponsored in the dozens by the CIA and promoted by monarchism and advoctes of a corporative state – as well as by ultraliberal western banking interests. 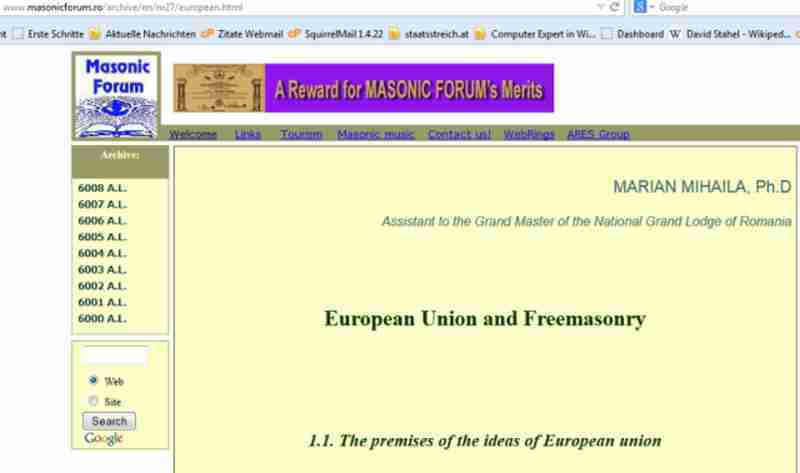 European unification has been a constant phantasma of international masonry and not only for them. Other discreet and publicly invisible secret societies from Cercle Pinay to Bilderberg joined in. “It’s a big club and you and I ain’t in it”, as late George Carlin would have phrased it. No matter how politically diverse this club may be, there are at least two links connecting the members: an antidemocratic penchant and their bias for “european solutions”. The two of them are like siamese twins – attached at the hip. The chapter starts out with two contemporary thinkers. One is award winning essayist Robert Menasse, who favors the rule of an enlightened “Josephinian” central bureaucracy: The commission in Brussels and its host of dinghies (EU agencies). Alan Posener, a german writer, lays the ground for a benevolent european imperialism. In a sense it has already arrived, he contends in a book which had been published shortly before the start of the financial crisis. The next subsection is dedicated to Richard Coudenhove-Kalergi, the founder and boss of the Paneuropean Movement. In his later days Coudenhove was the figurehead of a decidedly conservative school of thinking, his successor being Otto von Habsburg. But in his youth he advocated an strange mixture of europeanist elitism, bolshevism and philosemitism . Coudenhove was also a freemason. His movement was sponsored by members of this cult in the United States, as the hoodwinkers have come to admit themselves. But Coudenhove’s Paneurope has another deep source of ideas, the antichristian 19th century philosopher Friedrich Nietzsche. This man was an advocate of extreme elitism. Against popular belief Nietzsche was not a german nationalist. If he was a nationalist at all, he was a european one, a direct ancestor of modern day’s “ardent europeans”. For him, future Europe would set the stage for the appearance of new human and quasihuman species: slave men and super men. The last portion addresses Jean Monnet, who was exactly the opposite of what the French call “homme de lettres”. He might not fit in here smoothly. Monnet was a political practitioner and the hallways of political power were his study. The reason why he belongs here nonetheless is this: The kind of networking, lobbyism, trafficking of influence, and trickery he taught his disciples has hugely influenced what you call european politics today. 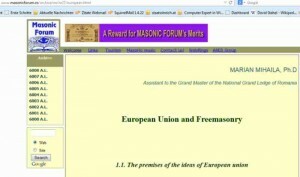 “A shady business man at the cradle of the EU” was already published on the 16th march. It can be found here. Introduction and Menasse will be online on thursday, Coudenhove’s and Nietzsche’s episodes will follow on friday in “Volltext”. As always, the original text can only be provided in german – at least at the time being.